I used to be really sarcastic as a teenager, it was at a time when there was no real need for me to interact with people. Nowadays (luckily) my function in social situations is rather to be a know-it-all, (not too funny) comedian or the most quiet person on Earth. Which makes it maybe difficult to understand why would I go through all of the entries in this dictionary, some of which are funny, but most of which even I’d consider mean and hence sarcastic as well. Masochist: A person with a job. Professor: Someone who has to deal with students in order to pay off a student loan. 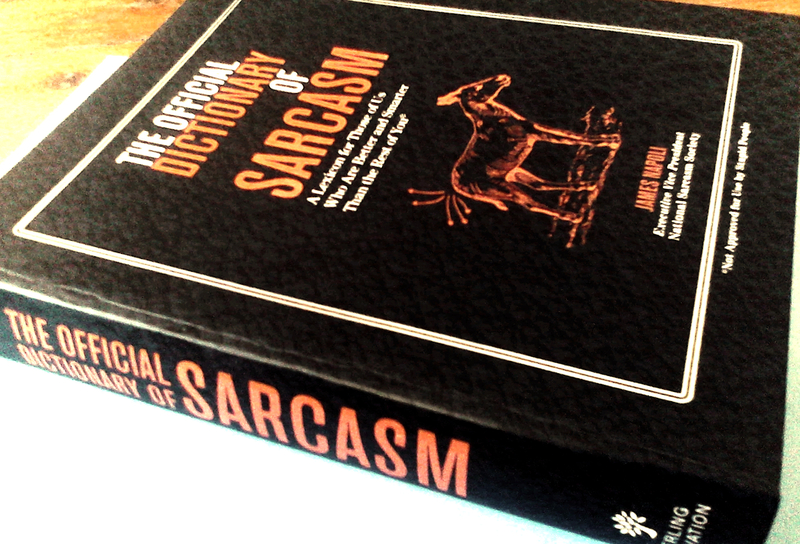 Reading this 300+ page long dictionary from cover to cover did point out that maybe there really are some books that you should read right away when you buy them, because some years later you might not be a sarcastic know-it-all who has to comment on everything. i might have found this book inspirational and people would have had an even more difficult time dealing with me. It would make for an excellent gift for that awfully sarcastic person (unless it’s you, in which case the totally delightfully funny person) you know. I might have lost my sense of humour somewhere, maybe it’s in actuality funnier and more entertaining. This entry was posted in Fiction and tagged book review, books, James Napoli, sarcasm, The Official Dictionary of Sarcasm. Bookmark the permalink.